Carved into the jungle covered hills on the edge of the Pacific Ocean, Reserva Conchal Golf Course is a real golfer’s tropical paradise. At the Reserva Conchal Golf Club, The magnificent 7,030-yard coastal golf course was designed by the world renown golf course architect, Robert Trent Jones ll. This course, located in a beautiful secluded valley filled by the sound of the ocean as it beats steadily onto the nearby shore, is a true pleasure to play. Its perfect rolling greens are tucked into the edges of the surrounding jungle, making a round of golf at Garra de Leon a real adventure! Adding to its natural beauty, majestic trees, native to Costa Rica, are scattered throughout the golf course. The designer, Robert Trent Jones ll, creatively uses these impressive trees as guardians for the uniquely laid out greens, shade for tee boxes and for marking the edges of the wide and inviting fairways. In Costa Rica’s northern zone, Guanacaste, the sun comes up early; allowing for a pleasant round of golf filled with the sounds of monkeys, jungle animals, and the refreshing sea breezes. For the early risers, it’s possible to get in a full round of golf and still catch the wonderful buffet breakfast offered by the hotel poolside. 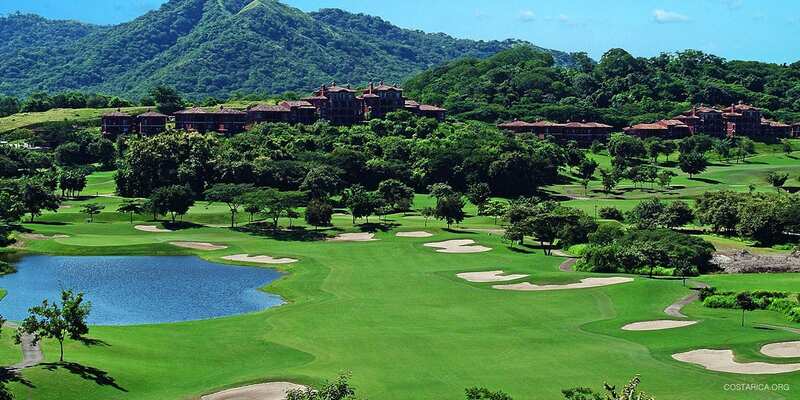 Reserva Conchal Golf Course is competing with the Cariari Country Club in San Jose, for the honor of being considered the finest golfing facility in all of Central America. It is a course you can’t wait to play over and over and over again. A truly unforgettable experience! The spectacular resort, The Paradisus Playa Conchal, surrounding Reserva Conchal Golf Course is considered the most luxurious golf & beach resort in the entire Central American continent. Nestled in this pristine valley, near white sandy beaches, luxurious bungalows and private villas provide the comfort and luxury for those fortunate to be staying at this exclusive golf resort. No expense has been spared when designing these private accommodations, including the surrounding lush and tropical botanical garden setting. We offer quality rental equipment. Taylor made Golf Clubs and Foot Joy Golf Shoes. metal spikes, collared shirts, and socks. It is recommended to make Tee-Time reservations in advance. Available times are from 6:30 am – 3:00 pm. Otherwise, a 50% cancellation fee will apply. No shows will be charged the entire amount. levels of play regardless of experience and ability. otherwise posted. There is no additional charge for those who are playing golf. Golf Cars are NOT mandatory. You must hold a valid driver’s license to operate golf cars.